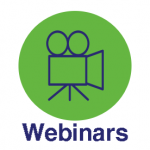 CHARGE Syndrome Foundation Webinars are provided with support from the National Center on Deaf-Blindness. If you have a suggestion for a future webinar topic, please send it to info@chargesyndrome.org. Watch for registration information in your email inbox or sign up for eNews now. Interveners: How can parents advocate for Intervener services for their children? Interveners: What training is required and how can the need for Intervener services be determined? Interveners: Who are they? Why are they critical for individuals with deafblindness? This webinar was provided with support from Perkins.